The memorial was erected in March of 1961, and many newspapers of the day contained an Associated Press article regarding its dedication and the history of Dr. Mudd. The fact is though, while the government was willing to place a memorial to a doctor who bravely administered to many sick soldiers and inmates at the assumed risk of his own life, they were not comfortable declaring that Dr. Mudd was wrongfully imprisoned. In fact, it took several years to get Dr. Mudd this memorial, and even then it was not what Dr. Richard Mudd truly hoped for. 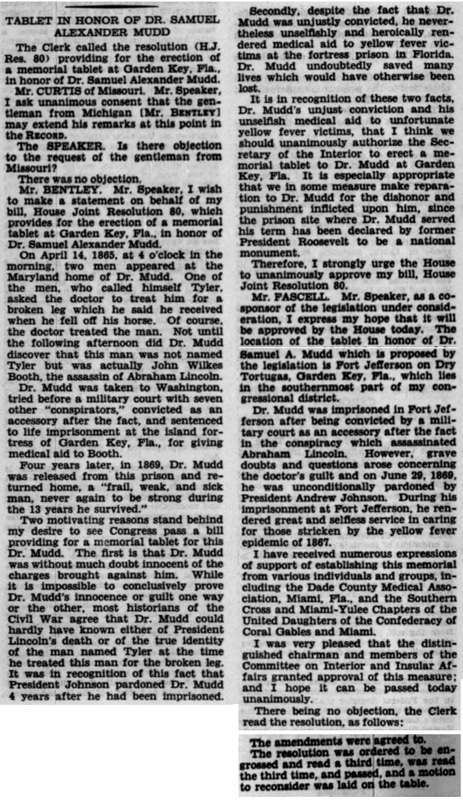 The first attempt that I’ve been able to find regarding a public memorial for Dr. Mudd was in February of 1936, during the second session of the 74th Congress. A West Virginian Representative named Jennings Randolph introduced House Joint Resolution 496 on February 24th. It can be assumed that the catalyst for Rep. Randolph’s bill was the new movie, “The Prisoner of Shark Island”. The film had its debut in New York on February 12th, 1936 and was released nationwide on February 28th. Publicity about the movie was in many newspapers and each reiterated the popular view of Dr. Mudd’s complete innocence. H. J. Res. 496 called for the “erection of a memorial to Dr. Samuel A. Mudd”. It was first sent to the House’s Committee on Public Lands. The Committee, in turn, contacted the Department of the Interior to gain their perspective on the idea. 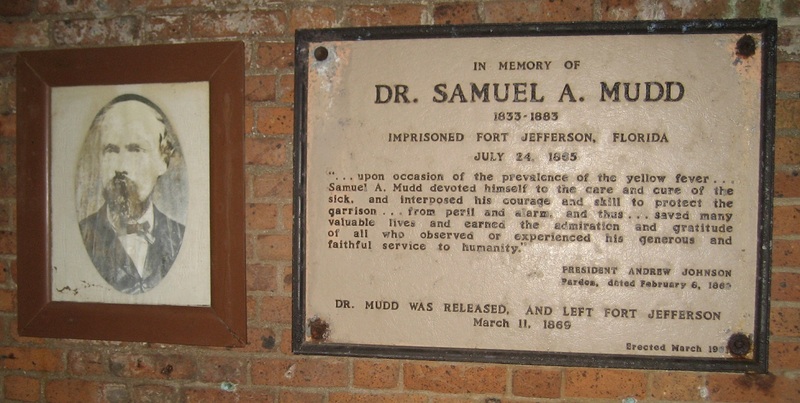 On April 16th, the Department of the Interior sent back a letter in favor of the memorial stating, “The proposal to place a tablet to the memory of Dr. Mudd on the ruins of Fort Jefferson appears to have merit in view of the outstanding services performed at Fort Jefferson by this member of the medical profession.” In addition, the Secretary of the Interior hoped that this tablet would, “increase the historical interest of old Fort Jefferson.” With the blessing of the Department of the Interior (given the understanding that the House would set aside the funds to complete the memorial and not the DoI) the Committee on Public Lands reported back on the bill favorably on May 28th, 1936. While alarmist and hyperbolic in this edition, the Society for Correct Civil War Information did devote articles in a few other bulletins fighting against the popular belief that Dr. Mudd was a completely innocent country doctor. Five days later was the last day of the 74th Congress. H. J. Res. 496 died. This time, Representative Randolph’s bill never made it out of the Committee of Public Lands. Again, the measure died. Let’s fast forward now to 1959 and the 86th Congress. Though The Prisoner of Shark Island is no longer on the minds of the American public, Dr. Richard D. Mudd has been working tirelessly to clear his grandfather’s name. He entices his congressman, Representative Alvin Bentley of Michigan’s 8th district, to propose House Joint Resolution 80 entitled, “Providing for the erection of a memorial tablet at Garden Key, FLA., in honor of Dr. Samuel Alexander Mudd”. Dr. Richard Mudd was 35 when the first few attempts to honor his grandfather failed, and this time he was determined to push it through. In addition to Rep. Bentley of Michigan, Mudd instilled the help of Representative Dante Fascell of Florida. Fort Jefferson was in Rep. Fascell’s district. Fascell proposed a practically identical bill to Rep. Bentley’s, House Joint Resolution 433. Dr. Richard Mudd was doubling his odds at getting a memorial to his grandfather. With the approval of the Department of the Interior, the Committee reported favorably on H. J. R. 80… with one amendment. The bill, having passed the House and Senate was turned over to the President for final signature and approval. On September 21st, 1959, President Einsenhower signed the bill into law. Dr. Mudd got his memorial at last. Very interesting story Dave. Unlike the Dr., I visited Ft. Jefferson under different circumstances. It is a beautiful place; history and nature combined.